I took this picture at Ushaka Marine World in Durban, South Africa. 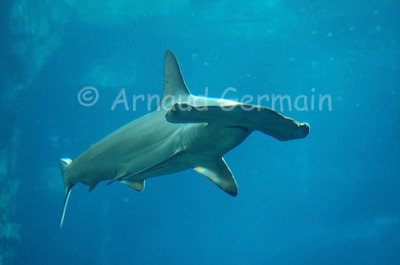 In the wild, I have encountered adult hammerheads in Egypt and in South Africa, and they are incredibly shy. I managed to take a few pictures but usually from quite far away. In the aquarium, these juveniles were circling and coming close to the window. I used my 18-70mm lens and handheld the camera.